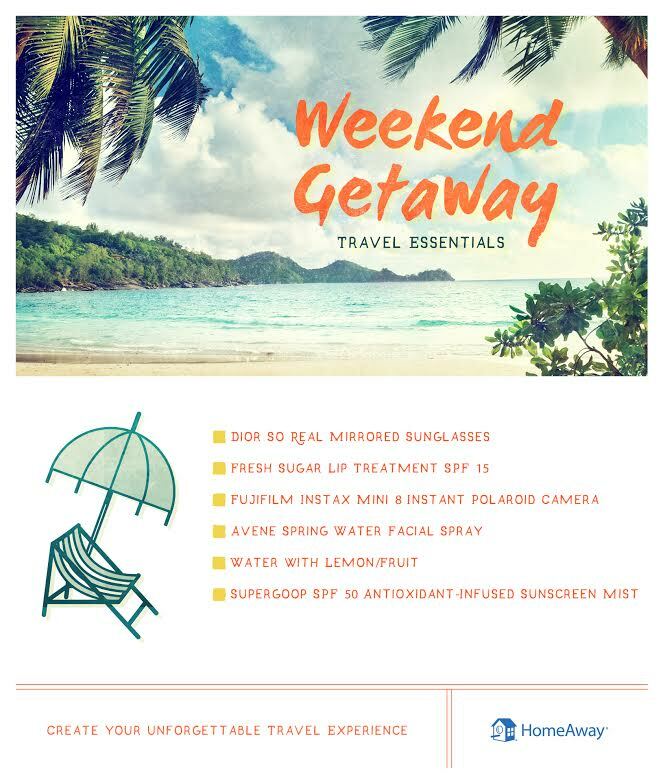 Miss Singh: WEEKEND GETAWAY ESSENTIALS FT. HOMEAWAY! WEEKEND GETAWAY ESSENTIALS FT. HOMEAWAY! Spring is here, and even though the weather is getting better in New York, I wouldn't mind sunbathing on a beach sipping delicious mojitos! I am always up for vacation and if you know me, you know I love traveling! I am actually going away this weekend to New Orleans(be excited for a new travel post) and I thought this would be the perfect time to share my weekend getaway essentials. I partnered up with HomeAway to prepare this list for you guys. HomeAway is a vacation rental marketplace with more than 1,000,000 vacation rental listings in 190 countries that you can rent and enjoy when you are away on a trip. Now on to my essentials..I have a ton, but these are the basic ones that are always with me when I travel. I am dying to go to somewhere like Punta Cana or even somewhere closer like Florida Panhandle with sunny locations like St. George Island, which is home to some beautiful lighthouses and Panama City Beach! Dior So Real Sunglasses: I absolutely love these sunglasses and cannot stop wearing them. They make any outfit super chic and match everything I wear. They are a little pricey, but there are similar dupes at local stores like Forever 21. I just think they are cool and I love them! Fresh Sugar Lip Balm SPF 15: I know how essential it is to protect your skin from the sun, but so are your lips people! I love the smell of this stuff and its super nourishing. This will help your lips stay smooth and not crack while your out and about or laying by the pool. Fujifilm Instax Mini 8 Camera: Polaroid cameras are back and such a big trend now, but I have always loved them. Perfect to capture your holiday memories and of course adorable for Instagram pictures! Avene Facial Spray: I love Avene products and this one is always in my travel bag. This facial mist helps hydrate the skin without being greasy or messy. It is perfect to throw in your beach bag or if you are walking around town. When I need a pick me up, this is what I always grab. Water with Lemon/Fruit: Yes!! Hydrating yourself is super essential and even those unlimited cocktails are amazing, water is a must. I like to squeeze some lemon and add fruits to a bottle to make my own natural flavored water. It's easy, delicious and of course great for you. Supergoop SPF 50 Sunscreen Spray: I go nowhere without sunscreen, especially when I am on vacation and this stuff is game changer. Applying a ton of lotion all over my body takes too much time when I am going to the beach or pool, which is why this spray makes life easy and protects the skin from skin damage. Super convenient and does the job! 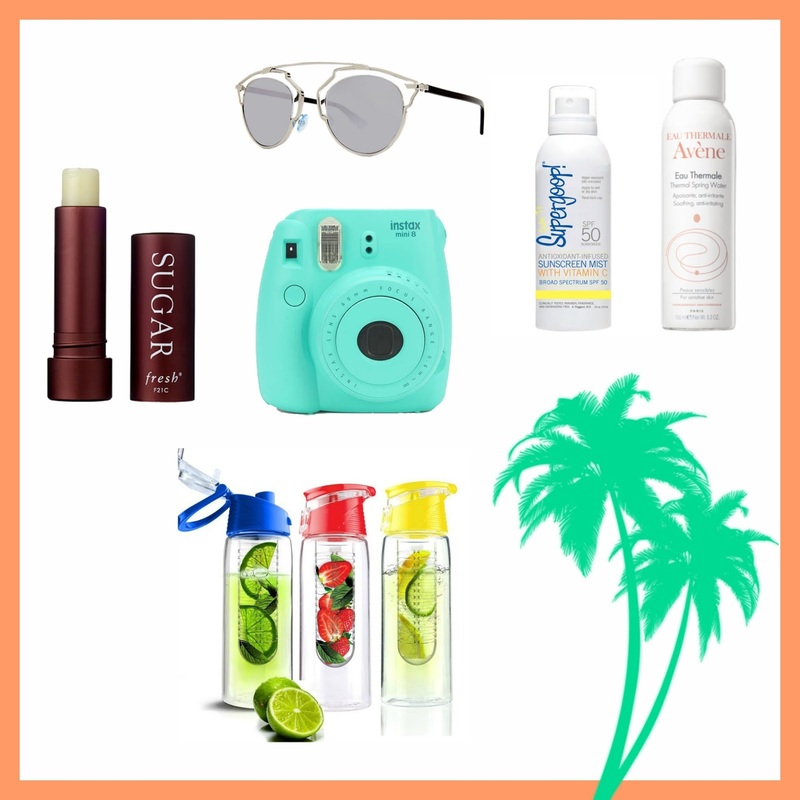 Where do you want to travel next and what are your essentials? Have you used HomeAway? Disclaimer: I was contacted by HomeAway to partner with them on this post and they helped prepare it with me. I was not PAID in any form for writing this post.